After Refugio Paz de las Aves it would be extremely difficult to see anything that could remotely compare to the incredible birds we had just experienced. Fortunately for we birders from Queens exploring Ecuador there was one spot where we were guaranteed to see birds so bizarrely awesome that they could follow almost any birding experience, no matter how intense or impressive. I don’t know about you, but a night-flying frugivore that echo-locates, has a three-foot wingspan, and calls in a way that has been likened to a man being tortured seems pretty cool to me. And seeing Steatornis caripensis was as cool an experience as I had hoped. So what the heck am I talking about? Oilbirds, of course! Oilbirds are most commonly seen by birders at the famous caves in Trinadad, which is odd because Trinidad is the only island on which this northern South American species is found. 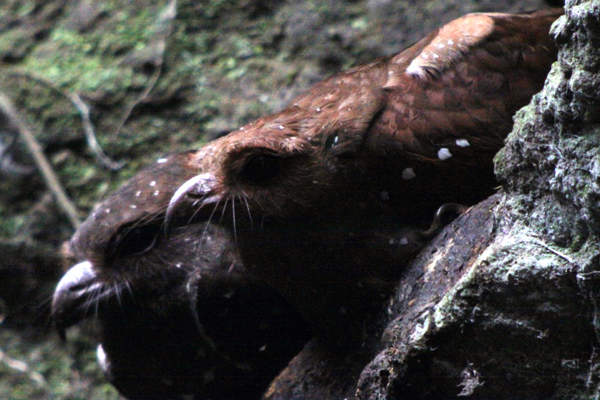 Closely resembling nightjars, Oilbirds are taxonomically sorted into the same order as them but given a family of their own, Steatornithidae. The fruit of the oil palm is their main food source, and Oilbirds derive their common name from the now obsolete practice of rendering their extremely plump young for oil. Our trip to see Oilbirds was easy. There are two locations near the town of Chontal, one of which requires climbing down several ladders which, while it sounded neat, would have been too much for some members of our group. Instead, we took the walk-up option, and visited a narrow and steep ravine that has been gated at the bottom. The gate was unlocked, we walked fifteen yards up the ravine, and an unworldly screaming started as a few Oilbirds that had roosted close to the entrance moved up the ravine past the barrier in place to prevent folks from disturbing the entire ravine’s worth of Oilbirds. To be honest, I was not happy that any birds were disturbed but I manage to rationalize the our presence by thinking that birding tourists coming and paying to see the birds, even if there is minor disturbance to a few of the birds, is better then no one coming to see the birds which means that there is no economic reason to conserve them (for example, by fencing off their ravine which keeps the cows out). The birds keep coming back to the ravine which means that the disturbance caused by birders is not enough to make the ravine less attractive than other possible roosting spots. 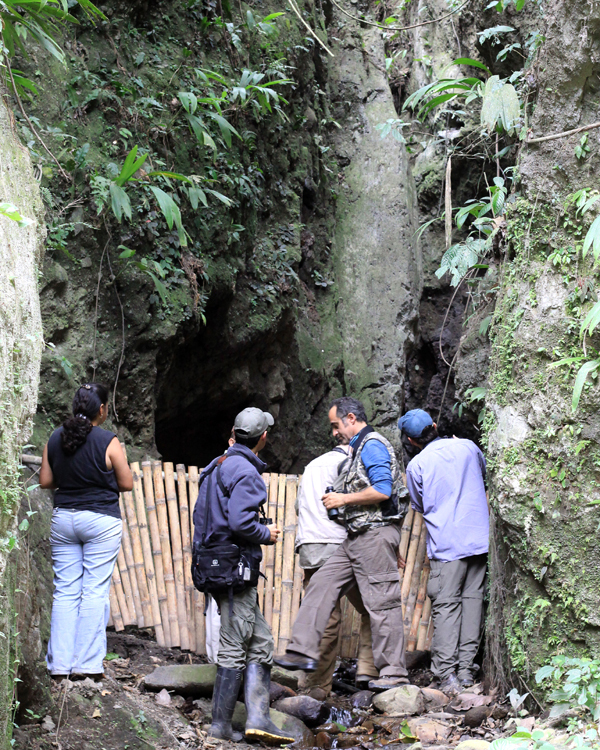 Does anyone out there have any idea about the long-term impact of tourists on Oilbird roosts? As obscured as our ultimate impact on the birds might be the birds’ impact on us was obvious and immediate. We all decided that Oilbirds are one heck of a cool species and hope that they will long be with us for others to experience and for their own intrinsic value. I don’t like disturbing birds either, especially in a location that sees a lot of birders but, like you say, at least the locals realize that they have something there to protect. What a cool species! After you described the call, I had to go hear a recording and found this on Xeno-Canto. What an eerie sound. That last image with the two birds on the rock is great. Is that digiscoped? @Larry: Yes it was digiscoped, and in extremely low light. And thanks for the xeno-canto link: I always forget to look for links to sounds that I reference. @Charlie: I will make sure that the next time I disturb an Oilbird, accidentally or not, that you are there to supervise. You have done it again Corey, nice post.